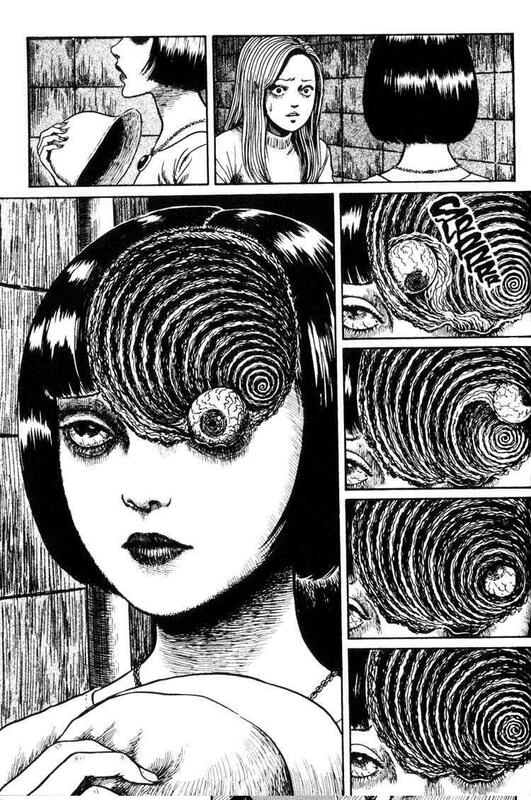 In the words of the American film critic Bob Chipman “comics are weird”, and none-more-so than Junji Ito’s Uzumaki (Spiral). It is a fantastic work of art and Junji proves, what many people have long suspected, that if you want true horror you need an ex-dentist to create it. The story starts in Kurouzu Cho a small seaside town in Japan where Kirie, a high school girl, finds the father of her friend Shuichi squatting in an alley transfixed by a snail crawling up a wall. Shuchi explains that his father has become obsessed with spirals and that he thinks, “The town is contaminated with spirals.” He is proven to be all too right when his father turns up dead in a wooden tub contorted in on himself. That's how it starts, as with individuals but as the curse gets stronger people start turn into snails, lighthouses burn people alive, and whirlpools trap them all there with the spiral. Bombarded by all this, the people are driven into spiral-induced madness, or warp into warped curving forms and even the town itself begins to change to resemble the spiral. As was pointed out by Vice’s art editor Nick Gazin, it resembles the work of H. P. Lovecraft -though it is not in any way connected to the somewhat overexposed Mythos- in that the spiral is an intelligence beyond humanity with its own logic, goals well outside the understanding anything we can comprehend. My only criticism of the story is that sometimes people in the story, with the exception of Shuichi, seem remarkably calm about the things happening to them. For example, one of the high school students turns into a snail –all drawn in loving detail- and the students just put him in a hutch in the schoolyard and go back to classes. The story isn’t really too worried about constancy. Although there is an overarching plot with a haunting payoff, it’s more about the individual horror of the week. Albeit not necessarily the most important thing, the quality of the art does not necessarily dictate the quality of the graphic novel or manga. Ito’s drawings in classical Japanese manga style are black and white but he avoids exaggerations, big eyes, ridiculous haircuts and gravity-defying costumes that often characterise manga. It is also nice to see characters that are distinctly Japanese-looking rather than the polished characters you get in a lot of shonen manga. The drawings are very detailed and un-stylised, putting a lot of work into quite humdrum images of school and a sleepy seaside town. Like any great work of horror, building up the mood is what’s so important. Throughout the slower scenes at the beginning of the book, great details go into doing this: A normal street and just a slither of sky churning in the background, a troubled look on the face of a passer-by, a snail on a wall or the mountains looming behind the character, a solid wall of darkness. When the story gets going, the gore starts flowing and the body horror begins. That same craftsmanship is put to dark uses with every spiral-conceived horror drawn in such detail that raises the heckles and unsettles you at a very gut level. I really wanted to show some of the more creative monstrosities but that would, without a doubt, ruin the fun. If you are a comics fan or a horror fan and want to read something that brings out the very best in both genres, Uzumaki is a classic that will stay with you long after you finish it, even if you don't want it too.